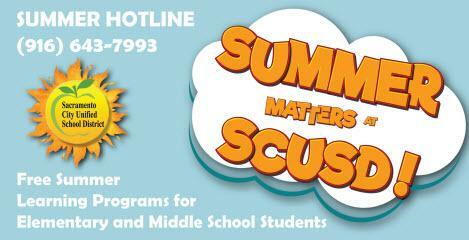 Summer Matters at SCUSD offers unique free programming opportunities across multiple school and community-based sites that unlock curiosity, inspire engagement and promote leadership. See details below on our various summer programs. Summer of Service at SCUSD is an exciting 6-week program that gives incoming 7th and 8th grade students the opportunity to become agents of change in their new schools by completing student-led projects that incorporate both research and action through a human design thinking model. District Program March 27, 2017 Deadline to apply is April 26, 2019. SCUSD is searching for highly motivated incoming sophomore, junior and senior high school age students to serve as Ambassadors at our Elementary, Middle and High School summer program sites. We are looking for committed, reliable and enthusiastic students for these leadership roles. Ambassadors will assist with projects and lead activities specific to their summer program site. At the end of the program, Ambassadors will have the opportunity to earn five high school credits and a monetary stipend for their service and completion of project. District Program April 18, 2018 Deadline to apply is Friday, April 19, 2019. The Summer at City Hall program is a six-week summer program taught by certified high school teachers with an emphasis on teaching civic engagement and youth development through interactive and small group classes. Students will be required to complete a 42-hour internship in addition to the regular instructional classroom sessions. Internship schedules and locations vary depending on internship assignments.